The Greater Power Catalyst is a Blood Magic Alchemy reagent. Applying it to a potion increases the potion's strength and decreases its duration. 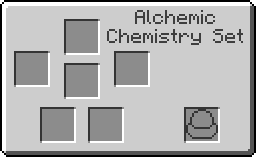 To apply the catalyst to a potion, place the potion to enhance, the catalyst and the item used to create the effect to be enhanced into an Alchemic Chemistry Set. This is an example recipe. You can use another reagent instead Blaze Powder. See the list of available reagents on Potion Flask page. Increases Strength effect to level 4, but reduces its duration. Greater Power Catalyst has no known uses in crafting. This page was last modified on 14 December 2018, at 15:08.